After I went to MoMA I wandered downtown making my way overland to Penn Station. My route took me past the New York Public Library so I decided to duck inside and see Winnie the Pooh (and send a photo to my kids). I had no idea what the special exhibition was and was pleased to see it was photography-related. I had not heard of Anna Atkins before so I was just interested in seeing a bunch of old cyanotypes. There’s something wonderful about the old photographic processes and the way the images emerge from the exposed, colored paper. So unlike anything we’re used to seeing today while also being simple and tactile. My son made a cyanotype photogram in school this year and I love it. Just seeing the flowers and the shadows they leave on the paper captures so much of the wonder of photography and the way that real things are transformed by how they interact with light. Anna Atkins is a master. The exhibition was a small gallery filled with prints and bound books of cyanotypes. All kinds of plants delicately arranged on the paper and printed so you can see both their shadows and translucency. They evoke pressed flowers but also have an elegance in how they abstract things to the simple single-color tonal range. They’re wonderful to look at and see as scientific observations and recording where you can compare the plants and their structures. They’re also flat-out beautiful prints* which are perfect for something like seaweed which floats in water and plays with filtered light. *Lots of good examples over at Hyperallergic. One of my favorite exhibits in the Monterey Bay Aquarium is the one which shows the kelp forest and places the kelp between me and the sunlight so I can get a sense of how magical the light in the forests must be. It’s a difficult thing to capture well with a camera and many of these cyanotypes put my attempts to shame. It’s not just the plant prints that are great though. Atkins used the cyanotype process as a way to print entire books. Text and title pages are all printed as blue prints. It’s a wonderful way to home-brew your own printing just in general and creates a book where everything feels incredibly consistent. Yes, book. Many of these prints are bound into large volumes of prints. There’s a book of British seaweed. Another of British flowers. I found myself inspecting the bindings to try and figure out how the heck they were assembled since they can’t be bound signatures. Some of the books are clearly assembled sheets with the edges sewn together. No edge or face trim has left them looking pretty ragged since the pages aren’t exactly the same size or aligned perfectly. Others though look like proper books with gilt edges and I really can’t see how the pages were assembled. It’s an impressive binding job that the exhibit doesn’t even call attention to. *Collector Daily has a decent write up. I did however especially enjoy Alison Rossier’s exposed expired photo paper both in the simplicity of the work and how it shows the numerous different responses that paper can have to light. As usual, while I went to MoMA to see the Yugoslav Architecture exhibition, I wandered around the rest of the building to see what else was on display. There was a nice exhibit of Charles White’s work which demonstrates his versatility as an artist. All kinds of mediums—charcoal sketches, woodcuts, prints, paintings, photographs*—with a wide range of styles as continued to produce work from the 1930s through the 1970s. *Admittedly the photographs weren’t presented as “art” but were still a nice personal set of portraits of White’s milieu. The change in styles is kind of wonderful to see as it offers a way of learning about American art from the nostalgia-focused 1930s art to the social activism of the 1960s and 70s. Many of the pieces weren’t my kind of thing although I could still appreciate how all throughout White depicts facets of life that aren’t the “standard” image because he’s centering non-white subjects. I however loved his sketches and woodcuts and also really liked his journey to Mexico with Elizabeth Catlett where he worked with worked with the Taller de Gráfica Popular. * White’s linework is fantastic and working in a print shop allowed him to embrace how prints and distribution are the true disruptive vector in artwork. *Which while I didn’t mention by name in my Mexican Modernism post is definitely a huge portion of Mexico’s artistic and anti-fascist identity. The “big” show at MoMa was their Bruce Nauman retrospective. I did not venture to the PS1 location so I only saw part of the show. I walked through but didn’t take a lot of note. I very much enjoy Nauman’s tweaking of the “is that art” question that I can hear my kids asking me. I just didn’t feel drawn to spend a lot of time looking at or thinking about the pieces. I did enjoy how so many of them operate as selfie-bait. This kind of thing has become the scourge of museums as every exhibition seems to need some sort of social media tie-in now. Many of Nauman’s pieces though create art by intentionally removing people from the piece. * When people insert themselves back in to take their photos, the result is an image which pretty much ruins the point of the artwork. *The video cameras which show your movement but only if you’re in a location that can’t see the monitor are probably the best example here. So many selfies inserting themselves back into the artwork. I couldn’t help but smile a little. David Hammons. Out of Bounds. 1995–96. I always take the time to at least walk through the permanent collection. This time there was a small exhibition focusing on artwork made by artists as they aged. 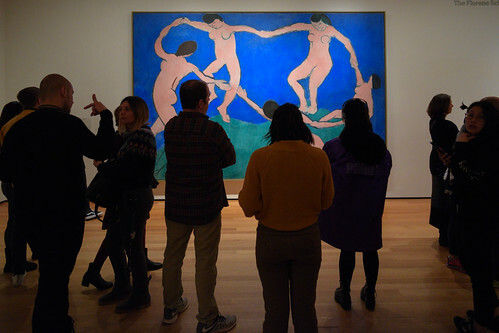 So rather than focusing on a greatest hit, this show organized each gallery around one artists work as a way of showing how their work has progressed. It’s a fun way to see the art and there were a lot of artists featured who I’ve liked for a long time—Agnes Martin, Helen Levitt, Ellsworth Kelly—and artists I don’t—Philip Guston, Joseph Beuys—but all of whom make up a decent canon of artists you’re supposed to know and recognize. It’s always a good thing to learn more than just the greatest hits of these guys. My favorite section was David Hammons’s work since I was less familiar with it than I should’ve been. Then I went to the next floor and hit the greatest hits galleries. They were packed even though this was a Wednesday visit during early January. I walked through quickly but said hi to all the cliches and grabbed a quick photo showing how crowded it was. The cliches are good to see and remind myself of what they look like in the flesh. How large—or not— they are. Details I always overlook in reproductions such as unpainted portions of the canvas. The out-of-gamut colors that can never be translated into standard process inks. 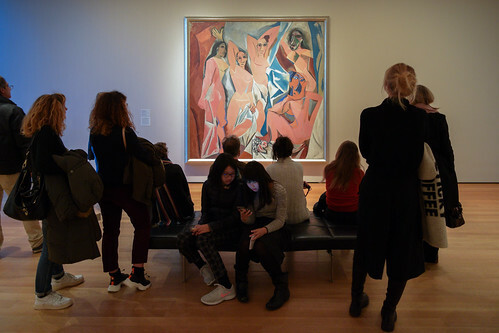 It’s good to see them and I found myself being jealous of the school groups who could just come to MoMA and learn about art. My kids are getting close to the right age and pretty sone I’ll be taking them here with a whole different set of eyes and a whole lot of patience. Brutalism is one of those architecture styles that’s easy to hate on. All that concrete tends to just look so different that what we’re used to in the US and the way we let it decay and age in this country doesn’t do it any favors either. *Yes it’s been closed for a month. It took me a while to write about this show. The exhibition started off very much like I expected by focusing on individual buildings. Often these are public spaces like fairgrounds* or stadiums** but they cover the gamut. Brutal headquarters, municipal buildings, churches, apartments, hotels, etc. *Like the Belgrade Fair with the largest concrete dome in the world before the Astrodome was built. **Such as Split’s brutal but also light and graceful soccer stadium. Despite the differences in scale, concrete is an extremely democratic building material. For something so ancient and basic—literally just sand held together with cement—it’s transformable into all kinds of wonderful forms and shapes which can evoke modern or futuristic feelings all the while maintaining that sense of connection to the earth. Brutalism is great in that it lets the concrete be concrete without trying to mimic any other architectural style or hide what it is. The buildings on display often feel massive and weighty yet they simultaneously soar. Some things—crazy cantilevers and thin load-bearing pillars—can only be done with reinforced concrete and the resulting structures appear surprisingly and disturbingly light and graceful. Milan Mihelič’s work in particular caught my eye here. It still looks space age despite being decades old. His buildings somehow turn concrete into a crystalline entity predisposed to self-sorting into stable geometric or fractal forms rather than an amorphous solid which gets poured into molds. Even as they age they maintain that aspect of otherworldliness. Compared to Mihelič, the Hotel Podgorica in Radević is a completely different feel. Instead of feeling space age it taps into a sense of ur-wall and connects an ancient sensibility to a modern construction. It’s still a wonderful building but it bridges how modernism and brutalism can exist in harmony with older traditions. I also liked the National Library of Kosovo in how it combines Muslim and Orthodox Christian motifs. It’s very much its own thing but for a building which is supposed to be a cultural caretaker in a region which has had more than its fair share of religiously-fueled violence it’s wonderful to see how it tries to be inclusive. This exhibition surprised me in how it transitioned from being about buildings to instead focusing on cities and spaces and how brutalism is not limited to just individual buildings but instead applies to an entire community or metropolis. Tatjana Neidhardt makes the observation that whitewashed-earth, cubic vernacular buildings are already modern and it’s pretty neat to see brutalism reframed this way. I love the way Zadar was redeveloped with modern buildings that still meander the way medieval city centers used to. As with the Hotel Podgorica it’s fantastic to see things that bridge modern and ancient and show how similar and compatible they actually are. The big gallery focusing on Skopje’s post-earthquake rebuilding though is sort of the keystone of the exhibition for me. Kenzō Tange’s designs plus the blank slate of earthquake rebuilding created the opportunity to design an entire city rather than just a building at a time. The buildings are still very interesting but it’s the spaces between them and how everything interacts that show how brutalism really works. Having so many models of groups of buildings in the gallery* is a great way to get a sense of the place and how it could feel like something new and different with the concrete buildings shaping the outside spaces as much as they shape the inside ones. *The exhibition used models throughout as a way of illustrating the buildings. In this case the architecture is clearly not drawing on the past in terms of the building forms but is drawing on it in terms of the public spaces being created between them. The idea that the buildings get used for their purposes of living or working but the open space is for everyone reminds me of the ways that parks and plazas are supposed to work in cities and how in older cities the paths and streets guide you to these public spaces. Where in the US brutalism often feels imposed and forced into environments, the nature of how it shapes the space outside buildings explains how it works so much differently on college campuses. I found myself thinking of Lebbeus Woods as I walked through this exhibition because so much of the brutalism feels like it has one foot in the science fiction esthetic as it is and there’s something organic about concrete and how it ages that makes so many of these buildings feel right up his alley. That there was a small display highlighting Woods’s visit to Yugoslavia after the 1990s war was absolutely perfect. I love his approach to dealing with the damaged buildings by respecting the damage and then designing around it. It takes the concept of ruin value and transforms it from the classic view of it as an actual ruin and makes it into something spectacularly modern. The other neat thing about this show is that it shows photographs right next to the architectural renderings. The photographs are particularly interesting to me since they almost feel like digital renderings where people are absent and things have been aged with grungy textures, graffiti, and after-market air conditioning units. * I believe they’re real but given how multiple wars have torn through this area I wasn’t completely certain. *It’s noteworthy how much these AC units add to the look of the place instead of detracting from it. Compared to the photographs it’s amazing how poorly the architectural drawings describe how these buildings work. Without any shadows you have to imagine the depth and think about how it will be transformed by light. This aspect of brutalism is definitely one of the things I like best about it as a photographer. Rather than waiting for a shadowless overcast day, so many of these buildings look best when the shadows are harsh. The freehand renderings and sketches do a much better job at describing the way the buildings will actually feel. Which is awesome since those are frequently imprecise and gestural while the buildings are so rigidly geometric. Of course it wasn’t just Susan Meiselas that I saw at SFMOMA. As always I took a spin through the buildings and took not of what caught my eye. There was a small gallery full of Stephen Frykholm’s Herman Miller Summer Picnic posters. These were a lot of fun in the way the abstracted food into graphic shapes and designs. Very colorful and appealing to me as a photographer. At the same time. Holy moly. This was a picnic with some peak whitey food to the point where I started imagining what posters for other demographics could look like. There was also a decent-sized exhibition looking at portrait photography. It’s one of those donor-centered shows which so I wasn’t inclined to spend a ton of time looking through it. But it’s doing some nice things in taking a dive through the collection and grouping things into themes—in this case various types of photographic portraits. One of the big problems here is that there’s a bit of the mile-wide, inch-thick thing going on where a lot of the photos are a bit out of context and function as needle drops. * I know enough context to see an appreciate a lot of what’s going on but it’s not something that makes for the most enjoyable show. *In which I realize that using “needle drop” as an analogy is something that will lose my kids completely. Still, the self portraits were particularly fun. They sort of always are though. The Masquerade section though was less fun because projects like Cindy Sherman’s work really need enough context so they don’t look like one-off costumes. The most interesting thing for me though was the comparison of Diane Arbus with Rineke Djikstra. Both of them work in portraiture but the portraits say as much, if not more, about the photographer than the sitter. It’s a good insight although I’d argue that it does a disservice to Arbus and the degree to which she finds sympathy with the subjects of her photographs. The gallery of Richard Artschwager art is a lot of fun as he just plays with our expectations for how objects should be finished. It verges on gimmickry but it doesn’t take itself too seriously. My favorite piece was Triptych III which treats Formica as a finished painting. And not just any Formica but a dark 1970s-textured one which looks either like imitation wood burl or leather which has gotten wet. It’s the kind of thing that evokes immediate feelings of nostalgia for my friends’ parents homes before they updated their kitchens or various greasy spoon restaurants I’ve eaten a burger in while travelling someplace in California. Something super-familiar but which I never really paid attention to and looked at. Just putting it up on the wall and inviting me to really look is both hilarious and wonderful. Monticello Cemetery, from the series Death of a Valley, 1956, printed 1960. It was wonderful to see Pirkle Jones and Dorothea Lange’s Death of a Valley photos. I don’t look enough at Pirkle Jones’s work but it’s fantastic. Very evocative of my sense of home as well as being beautifully sympathetic to the people and place he depicts. Lange of course is always excellent too. Having just taken a trip to the Central Valley earlier this summer,* I had noticed that all the “Congress Created Dust Bowl” signs that lined I5 the previous half-dozen years had been replaced with complaints about how we didn’t have proper reservoirs to save all the water that fell on the state in 2017. It’s pretty clear that the corporate farms in the valley think that any water which reaches the ocean is wasted so now they want to build reservoirs all over. *Featured in a few of the photos on this post. As I looked at the Jones and Lange photos I found myself ruefully laughing at the concept. The idea of displacing a community like this is something I can’t see anyone in the state feeling comfortable with and to see the evidence of what such a move entails reminds me of how demands for what we “should” do almost never come with any thought about how we should do it. It’s also not lost on me how, despite the sacrifice made to build Lake Berryessa, the state still needs more water than nature can supply. Nor can I avoid thinking about how with the way things are going, we’re more likely to see scenes like this play out again as we retreat from the coasts and move uphill as sea levels rise. Year of the Dragon [page 20], 1952. I thoroughly enjoyed the rooms of Charles Wong photos and Hung Liu prints. It’s always nice to see asian artists being treated as locals even though all the Liu prints weren’t of the Bay Area. Wong’s photos in particular are great since they show the life of San Francisco’s Chinatown and the uniqueness of Chinese-American culture. It’s always great to see an insider view showing how people lived and how the culture is such a mix of influences. Having just watched Chan is Missing I loved seeing a similar slice through the culture form the generation before. The design gallery this time had an exhibition of Donald Judd’s furniture. I appreciate how it (and Judd) draws a direct line from the Arts and Crafts movement to Judd’s designs. The connection is not one that’s obvious to anyone whose familiarity with Judd is mostly limited to his sculptures of multiple boxes attached to the wall; it’s very tempting to see his furniture as working in that esthetic. The arts and crafts framing is much much better. Taking clean lines to an extreme. Taking simple forms to an extreme. These aren’t arts and crafts any more but the rots are there and they work harmoniously with both older more decorative furniture as well as more-modern semi-industrial furniture. This exhibition was also the rare design exhibition which provides samples for people to use. You can’t just look at design, you have to use it in order to fully appreciate it. So I got to sit in a few different chairs and see how they felt. The verdict? Kind of disappointing as chairs but they work fine as benches or stools. And on the to floor in the contemporary galleries was an exhibition looking at current events. Many of the pieces on display are artists and work—e.g. Tiffany Chung, An Te Liu, Taryn Simon, and Trevor Paglen—I’ve seen before in other exhibitions and museums in the Bay Area. It’s always nice to see them again and see how well their work has aged and how it interacts with a different set of artworks. The works on display all touch on the pressing issues of today: security, our trust of government, racism, the imminent environmental collapse… It’s good to see all these things presented together since it’s increasingly obvious that they’re different faces of the same problem. 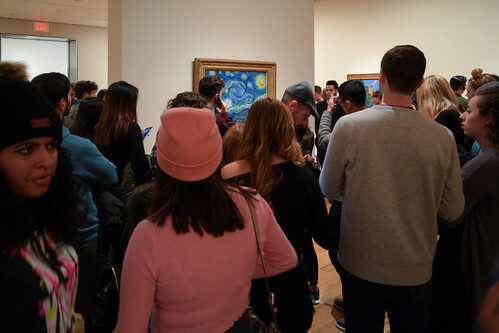 It’s interesting to me to see how certain aspects such as the environment or technological issues are very comfortable for museum goers to deal with and others are much more difficult. It’s no surprise which ones a lot of visitors are uncomfortable with. Something like Arthur Jafa’s work for example is much more foreign in San Francisco than anything involving data or technology. But it’s absolutely necessary to have it in the same space as work critiquing the news media or the government. Artists can point out the problems all they want but until there’s political will and coverage of that in the media ain’t nothing is going to get done and things will only get worse.